Set of four panels at Site 2 of the Westbury Village History Trail. A Millennium Project supported by Southern Arts. Carved and painted oak. top left panel: the baby born in a caravan at Smith's Fair. 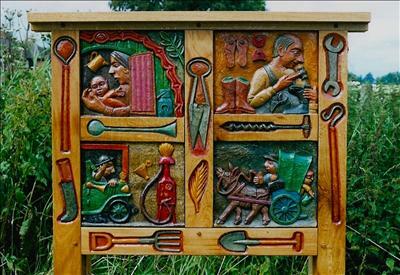 top right panel: the Village Cobbler. bottom left : the first village garage bottom right : the first District Nurse, funded in 1906 by wealthy local benefactress, travelled round in a unique old cart pulled by a stubborn donkey.